---Built-in WiFi ---Netflix, Amazon Video, BBC iPlayer etc. ---Screen Mirroring 3D Bluray player ---USB, HDMI and Digital Coax This item an ex-display item, latest firmare loaded and supplied with the Remote Control, User Manual, Batteries and we've popped a 1.5m HDMI cable in the box, so its ready to go out of the box! The Samsung BD-J5900 3D Blu-ray Player With WiFi features built-in WiFi and various TV Apps for easy streaming of digital content. It is also 3D capable for a truly exciting entertainment experience. The Samsung Blu-ray disc player has a lightweight, compact size that will fit smoothly with most entertainment equipment. It is simple to install so you can begin watching your favorite movies right away. This HD Blu-ray player has an ethernet and HDMI port, so you can get connected easily. SAMSUNG 3D BLU-RAY PLAYER - MODEL NO BD-36100. We no longer have 3D TV so we no longer use it. It plays: 3D Blu-Ray Discs, Blu-Ray Disks, DVDs and CDs. Good Working Order. SAMSUNG BD-E6100 Blu-RayPlayer. In good condition and fully working. HDR quality may vary depending on the content source, TV model and size. HDR-enabled TV needed for HDR benfits. 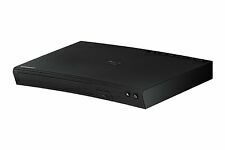 Samsung UBD-M7500 4K Ultra HD Blu-ray Player. HDR - Stunning brightness, deeper contrast. 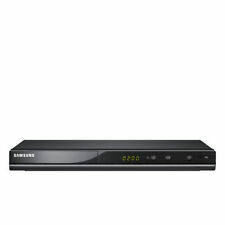 Samsung DVD-SH893M MULTI FORMAT DVD Recorder,Built in 160GB HARD DRIVE HDD, Freeview, HDMI,USB. Built in Freeview Tuner to receive Digital channels. The DVD-SH893 can record to its integrated 160GB hard disk or to almost any type of recordable DVD disc. Samsung BD-F5100 Blu-ray Player network/meadia player. Condition is Used. Dispatched with eBay delivery – Shutl 2-3 days. The discs usually work out much cheaper (espcially for special editions or Disney Movies), with more features on a disc, and a larger choice then on Region 2. Therefore, you need to modify a Region 2 machine to "multiregion" - this will then play any original DVD movie, from any region in the world. User Manual included. COLLECTION ONLY. The dvd side is a player only so you cannot use this machine to transfer your old vhs tapes to dvd. Free UK PP. Samsung UBD-K8500 Smart 4k Ultra HD 3D Blu-ray Player. Condition is Used, but in great condition! Will dispatch using courier with 1-3 day delivery service. Selling my Samsung UBD-K8500 4K Ultra HD Blu ray player. The player is like new and in perfect condition. It still has the plastic film on it. The player works flawlessly and provides a stunning 4k image and sound. Has only been used a handful of times. It comes with the player, remote control and power cable, I'll throw in an HDMI cable if I can find one. Will be shipped via DPD next day. 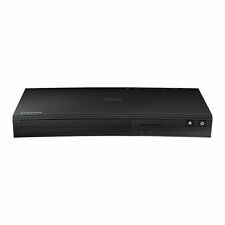 SAMSUNG DVD RECORDER DVD-SH855M Freeview HDMI 250GB HDD Black. Condition is Used. Samsung BD-J4500 HD Blu-ray Player - Black. Condition is Used. Dispatched with Other Courier (3 to 5 days). The Samsung BD-H6500 Smart 3D Blu-ray and DVD Player lets you access online content including Catch-up TV services ITV Player, BBC iPlayer, 4oD and Demand 5. You can enjoy stunning Full HD 3D and share content from smartphones and tablets with Samsung AllShare. This is a great little smart blu ray player which comes with the remote control. It has wifi so can use it via internet without ethernet.Turns tv into a smart one. It has a few little scuffs on the top but does not affect the way it works. From a smoke and pet free home. Samsung BD-E5300 Blu-Ray Disc Player. Netflix, Amazon Video, BBC iPlayer etc. It is simple to install so you can begin watching your favorite movies right away. This HD Blu-ray player has an ethernet and HDMI port, so you can get connected easily. This Samsung Blu Ray Player has been refurbished to its original state and is in fully working condition. It can be used to view blue ray Cd's and disks such as movies or home films. The price of this Blu Ray player has been reduced as it does not come with a remote but the remote can be bought separately online at a very cheap price. Samsung Blue Ray DVD Player. Good Condition & Working Order. Samsung Blue Ray 3D DVD BD-D5500. Condition is Used. Dispatched with eBay delivery – Shutl 2-3 days. Samsung Smart Blu-ray players allow you to easily search for movies, TV shows, explore Samsung apps and find many other types of new interactive content. Samsung apps is a growing collection of premium apps specifically built for your TV that connects you to your favorite digital content such as movies from Netflix or Blockbuster, TV shows from Hulu Plus, videos from YouTube, music from Pandora, and social updates from Facebook or Twitter. SAMSUNG DVD-SH893M MULTI FORMAT DVD Recorder 160GB HARD DRIVE HDD, Freeview, HDM. In good working condition. Including original box. Remote, power cable and HDMI cable included. Samsung DVD-H1080 DVD Player. Never been used. In box. Collection Woking. Surrey. Possible to delivery. Box opened to show the item but never used and totally brand new ! The boxSamsung BD-H6500 3D smart Blu Ray dvd Player,4k Upscale,WiFi,Browser,dlna,. Condition is New. Dispatched with eBay delivery – Shutl 2-3 days. It plays Blu-ray discs of all regions and displays 4K ultra-high definition video. It also supports connections via Ethernet, HDMI, USB, and Digital Audio Optical TOSLINK. For sale is my Samsung UBD-M9500 4K Ultra HD Blu-Ray player with Wi-Fi. 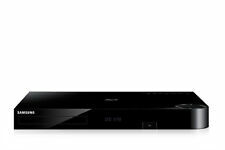 The Samsung BD-F6500 Smart 3D Blu-ray and DVD Player gives you access online content including the full range of Catch-up TV services (including ITV Player, BBC iPlayer, 4oD and Demand 5). Samsung Player. Samsung Blue-ray 3d Dvd Player. Condition is Used. Dispatched with eBay delivery – Shutl 2-3 days. Samsung Blu-Ray Player. This item has been powered on, and the functions have been tested and all appear to work correctly. Samsung Blu-ray Disc Player. Only used once when we rented a blue-ray movie. Can play Blue-ray, DVD video and DVD-RW/-R discs. Region code Blue-ray B and DVD-Video 2. Outputs: HDMI, Component and Video. Samsung DVD player and VHS recorder combo SV-DVD440 - Full Working Order. 6 Head HiFi Stereo, DVD /CD / CD-R / RW / MP3. A quality DVD player can transform the way you use your home entertainment system. There are a variety of options on eBay for those shopping for a Samsung DVD player. For more information, check out these frequent questions from those shopping for one. Will they also play Blu-rays? Yes. Many of the DVD players for sale on eBay can also play Blu-ray discs, making them a great two-in-one entertainment option. On top of being Blu-ray players, there are also players that can broadcast video in 3D. Simply connect it to your television to get started watching right away. What are some features of the DVD players? The Samsung DVD players have a variety of options on them to help improve your entertainment experience. The following are some customers' favourite features on the players. 4K - Some of the players can send video in 4K quality, so you can watch your movies in stunning high definition with crystal-clear resolution. Colour spectrum - Samsung DVD players have a wide colour spectrum, providing up to twice as many different colours as other players. Dolby Atmos - Take advantage of your surround sound home stereo system with a DVD player that broadcasts audio in Dolby Digital surround sound. Smart technology - Many of the Samsung DVD players can connect to Wi-Fi, allowing them to use online applications for streaming their favourite movies and television shows. CD-R - Certain models can record discs for printing using CD-R technology. How do you connect a Samsung DVD player? A Samsung DVD player has a variety of outputs. You can run audio out to a separate receiver using the RCA outputs on the back. Video can be broadcasted to a television using the S-video cable. For the highest picture quality, use the multi-pin HDMI out to the television. This will broadcast both video and audio to the television. Some models will also have an ethernet port, allowing you to hard-wire the player directly to a nearby router for streaming purposes. What formats can the DVD player play? The Samsung DVD player can play video and audio files off of a variety of different formats. The device can also record data off of a variety of different discs. The following are the kinds of discs that can be used in conjunction with a DVD or Blu-ray player.